We’d love your help. 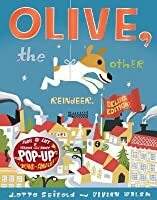 Let us know what’s wrong with this preview of Olive, the Other Reindeer by J. Otto Seibold. To ask other readers questions about Olive, the Other Reindeer, please sign up. The artwork reminds me of Picasso. The faces are like the famous painting ‘Guernica’ only happy. Olive is a dog who helps Santa out one year. She is listening to the song ‘Rudolph the red nosed reindeer and realizes it says ‘Olive the other reindeer’. She figures she must be a reindeer and heads to the North pole. I love that little piece of this story. She mis-hears a song and it changes her world view. How often to people hear different lyrics. I do it all the time. I remember everyone talking a The artwork reminds me of Picasso. The faces are like the famous painting ‘Guernica’ only happy. Olive is a dog who helps Santa out one year. She is listening to the song ‘Rudolph the red nosed reindeer and realizes it says ‘Olive the other reindeer’. She figures she must be a reindeer and heads to the North pole. I remember everyone talking about this little story when it came out and I never actually read it 20 years ago. I can’t believe it’s 21 years old now. It’s a very cute story and the children loved it. They laughed and giggled. They also gave it 5 stars. The niece loves this and sings Olive the other reindeer all the time and smiles. She had to read this to her parents as well. This one’s fun. 2.5 - This is pretty cute in a few ways. First, the illustrations really help the story along because Olive is just too darn cute. Second, her hearing "All of the other reindeer", yet really hearing "Olive, the other reindeer" makes the story so much fun to read. We both cracked up when I read that part. How Santa fixes the whole 'dogs can't fly' thing is just awesome. Everyone's seen illustrations of reindeer flying, it's in all of our brains, but who has ever seen the reindeer flying through t 2.5 - This is pretty cute in a few ways. First, the illustrations really help the story along because Olive is just too darn cute. Second, her hearing "All of the other reindeer", yet really hearing "Olive, the other reindeer" makes the story so much fun to read. We both cracked up when I read that part. How Santa fixes the whole 'dogs can't fly' thing is just awesome. Everyone's seen illustrations of reindeer flying, it's in all of our brains, but who has ever seen the reindeer flying through the night with a little doggie attached to a darn string hanging underneath them? Too cute! I'm pretty sure I liked the first time Olive saved the day after the crash but after that the story goes downhill - for me. This was not the case for Julia however. All of a sudden gumdrops are falling from the sleigh yet there is no reason for this for the next few pages. I was very confused to say the least. The author needed a way for a dog to be able to help with a dogs sense but this was reaching... and reaching faaarrrrr. I can get with the third save a bit easier but I still feel it could have been done better. The story ends with Santa needing Olive to guide the sleigh through some fog and with her nose smelling Mrs. Claus' cookies she's very able. She also receives a present of reindeer antlers which was very cute. I have to admit though, that middle part, with the two saves, really got to me and it took a lot away from the book. I can't help but feel that with a little extra thought those parts could have been a lot better. Aww! This is such a cute little book. It would make the perfect book to read, on Christmas eve while putting the little ones to bed. Silly, funny, a little heartwarming: Olive is a well-meaning but confused pup during the holidays. She mistakenly believes herself to be needed on the reindeer team. I don't have it handy, and will need to re-read before commenting further (lest I write a spoiler!). Where has this book been all my life? Holy adorable, man...Olive hears a Christmas song on the radio and realizes that she must have been mistaken thinking she was a dog, otherwise why would people be singing about "Olive, the other reindeer?" She goes to the North Pole to help Santa deliver presents and ends up saving the day multiple times. The beginning few pages are a little wordy for a younger group of kids, but the pace picks up quickly, and I think storytime groups would LOVE this book. 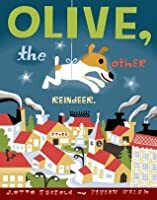 This is a fun story about a little dog named Olive who mishears the classic Christmas Rudolph song, "Olive, the other reindeer..." and thinks, wow, I must really be a reindeer. So, she goes to the north pole to help Santa. And help she does, in her own doggie way! :-) Very cute and fun story but the illustrations were not exactly my cup of tea. This book is definitely not a strong 4 star rating and I do not feel like wondering if it is a 3.5 or more but I am being generous considering the television special ruined this book. I remember as a kid I saw countless times every year the wonderful Olive, the Other Reindeer that had Drew Barrymore and since I never read books as a child I didn't know this tv special was adapted from a book. I have to admit while the animation for the special may look weird, the plot was 100 times better than t This book is definitely not a strong 4 star rating and I do not feel like wondering if it is a 3.5 or more but I am being generous considering the television special ruined this book. I remember as a kid I saw countless times every year the wonderful Olive, the Other Reindeer that had Drew Barrymore and since I never read books as a child I didn't know this tv special was adapted from a book. I have to admit while the animation for the special may look weird, the plot was 100 times better than this book. In the animated movie we get to see some action as to how Olive got to meet Santa and other evil characters that try to ruin Christmas and Olive's life. In this book there is actually zero drama. 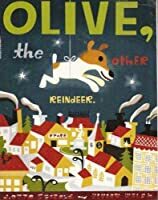 In the book, Olive hears the song Rudolph the Red Nose Reindeer but when they get to the part of "All of the other Reindeer", Olive hears Olive the other Reindeer. They play it so many times that Olive figures she must be a reindeer and not a dog and heads over to help Santa Claus. She arrives and Santa is about to take off and just for the hell of it he includes Olive with the other reindeers and fly off as Santa is performing his yearly duty. If I haven't seen the television special that I actually like and adore, this book would have been cute and sweet but I felt that it essentially lacked drama and details and doesn't really attract the reader into the story. Probably they had that issue in the book and figured if they made an animated feature out of it they could go into more details and pretty much make an entirely different story from the children's book. If you or your child falls into the same predicament as me then please do not read this book at all cost. For reading my review I feel like the only way to make justified I have included the television link down below and I suggest watching it if you want a quick and simple christmas movie with talking animals. 11) Walsh, V.; Seibold, J.O. (1997). Olive, the Other Reindeer. San Francisco: Chronicle Books. (Ages 2-5) While singing “Rudolph, the Red-Nosed Reindeer,” Olive hears the words: “Olive, the other reindeer,” and knows she must help Santa with his sleigh. Even though she is only a dog, Olive really does save the day, using the special talents only dogs have. The colorful, blocky illustrations are what caught my eye when choosing this book. The story is bright enough to be an antidote to the usual 11)	Walsh, V.; Seibold, J.O. (1997). Olive, the Other Reindeer. San Francisco: Chronicle Books. (Ages 2-5) While singing “Rudolph, the Red-Nosed Reindeer,” Olive hears the words: “Olive, the other reindeer,” and knows she must help Santa with his sleigh. Even though she is only a dog, Olive really does save the day, using the special talents only dogs have. The colorful, blocky illustrations are what caught my eye when choosing this book. The story is bright enough to be an antidote to the usual holiday fare, because it’s not about what one gets, but what one gives at Christmastime. Unfortunately, I wasn't as impressed with this book as I'd hoped to be, or as other readers seem to be. I found the illustrations to be a bit strange and not soft and cozy, which is how I think of Christmas. It also doesn't have a ton of logic (I can see kids questioning), in that there is mention at dogs can't fly, and a "solution," yet no mention of the fact that reindeer usually can't fly either. I think the cutest part of the book is the title and the "mis-heard lyrics" behind it. When we first received this book, I didn't think much of it. But after numerous readings, I realize that it has stood the test of time. We pull it out every Christmas and enjoy the quirky illustrations and the funny story. We notice new things every time and laugh at the things we remember. It also has a good message that everyone can find a place to help. I didn't like this book very much. I found the illustrations unattractive and I didn't much care for the story. I wanted to like it, because a very dear friend gave it to my child, but I just couldn't like it. The students always love this Christmas tale! Meh. It was cute, but obnoxious. How convenient that every mishap along the way was perfectly suited for a dog! I much would have appreciated a story about a bully reindeer named Olive that teased Rudolf, etc. etc. Its a good thing that Olive decides to join Santa on Christmas Eve. Olive saves Christmas! Leave it to a Jack Russell terrier to save Christmas – and to give marching orders to Santa and his reindeer! In J. Otto Siebold and Vivian Walsh's picture book, Olive, the Other Reindeer, a Russell (or Russell-lookalike!) named Olive mishears the line from the Rudolph the Red-Nosed Reindeer song, “All of the other reindeer” as “Olive, the other reindeer,” decides that she must be a reindeer, and promptly takes two buses and reports for duty at the North Pole. Santa and the reindeer tie Olive to Leave it to a Jack Russell terrier to save Christmas – and to give marching orders to Santa and his reindeer! In J. Otto Siebold and Vivian Walsh's picture book, Olive, the Other Reindeer, a Russell (or Russell-lookalike!) named Olive mishears the line from the Rudolph the Red-Nosed Reindeer song, “All of the other reindeer” as “Olive, the other reindeer,” decides that she must be a reindeer, and promptly takes two buses and reports for duty at the North Pole. Santa and the reindeer tie Olive to the flying sleigh with a ribbon so that she can join them in delivering presents on Christmas Eve. But when the team encounters a series of silly mishaps, Olive uses her unique abilities to keep them on course and guide them safely home. Not only is this a solid story and the illustrations pack the pages with a joyful style, but the book's thoughtful design is wall-to-wall. Instead of limiting their cheekiness to in between the title page and "The End," Vivian Walsh's and J.otto Seibold's combined charm pops up on the slip cover (check out the bios), the end papers, and even the bar code comes with a saucy message. The story is another version of how an individual's differences can be valuable to the group even though their oute Not only is this a solid story and the illustrations pack the pages with a joyful style, but the book's thoughtful design is wall-to-wall. Instead of limiting their cheekiness to in between the title page and "The End," Vivian Walsh's and J.otto Seibold's combined charm pops up on the slip cover (check out the bios), the end papers, and even the bar code comes with a saucy message. "Olive....the reindeer," said Olive, "I thought I was a dog. Hmmm....I must be a reindeer!" Odd little story that includes the typical 'oh no, we must save christmas' trope so common in kiddie books. Still the little dog is cute and the reindeer get bonus points for tying a dog to their sleigh to help fulfill his dreams. Luckily for them, the dog turns out to be helpful. Final note, I had no idea before doing this review that this book was also a christmas special....Do not be dismayed this book h "Olive....the reindeer," said Olive, "I thought I was a dog. Hmmm....I must be a reindeer!" Olive was in her dog house wrapping presents for Christmas when a song came on the radio. Olive misheard the song and sang “Olive, the other reindeer” instead of “All of the other reindeer” so she realized that she must be a reindeer and if she is a reindeer she must report to the North Pole to help Santa Claus. She makes the journey to the North Pole and even helps Santa save Christmas. This is a really cute story that shows that with a little magic you can do anything that you set your mind to. Olive was in her dog house wrapping presents for Christmas when a song came on the radio. Olive misheard the song and sang “Olive, the other reindeer” instead of “All of the other reindeer” so she realized that she must be a reindeer and if she is a reindeer she must report to the North Pole to help Santa Claus. She makes the journey to the North Pole and even helps Santa save Christmas. This is a really cute story that shows that with a little magic you can do anything that you set your mind to. This story can be enjoyed by all ages and is a nice twist to stories about reindeer. 4/19/1999 Truly, it is not a book. It is, however, based on one of our favorite Christmas books. This is a family favorite. I like Seibold's style a lot, and the plot is amusing. We even have an Olive advent calendar. We had to do a re-read before we set up the Olive Advent calendar. We love this book, still. Love this book and it's illustrations, will always be one of my favorites. Even the title itself has a cute play on words, this is a great Christmas time read. The story is about a dog who hears a Christmas song on the radio and then sets out on a funny journey. Kids love this book because of the goofy dog. Olive the dog hears the Christmas song and thinks it says Olive the Other Reindeer. She thinks maybe she's a reindeer and reports to Santa to help take the sleigh. They tie her on and she comes in handy by chewing sticks, retrieving gumdrops and flutes, and finally leading them home through the fog--her nose led her to Mrs. Claus's cookies. I love the humor in this book & the silly dog Olive is totally adorable. The kids laughed while I read it. I'd recommend it for the Christmas holiday season. It may run a bit on the long side, text wise, so it's probably better for older preschoolers and young elementary students. Cute little story, not really any plot but it's a picture book so you can't expect one. I'm giving it 4 stars based on my five year old's opinion of it. She's a fan. Quirky, cartoony illustrations; sweet character and storyline; oodles of Christmas spirit. American artist and children's book creator. With no formal art training, he was able to sneak into the art world during the "outsider art" craze of the 1990s. His book Mr. Lunch Takes a Plane Ride, published by Viking in 1993, was the first children's picture book to be created with digital media. His 1997 book Olive, the Other Reindeer led to an animated television special of the same name. His a American artist and children's book creator. With no formal art training, he was able to sneak into the art world during the "outsider art" craze of the 1990s. His book Mr. Lunch Takes a Plane Ride, published by Viking in 1993, was the first children's picture book to be created with digital media. 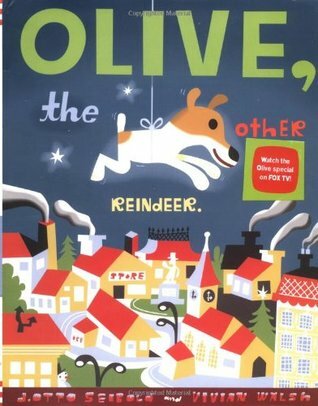 His 1997 book Olive, the Other Reindeer led to an animated television special of the same name. His art has been shown at Mass MOCA, Deitch Projects NYC, The Getty LA, Contemporary Jewish Museum SF, Grass Hut Portland, MOCA LA, The Yerba Buena Center for the Arts SF, Gallery Paule Anglim SF, Oakland Museum CA, Juxtapoz Gallery Detroit, and Galerie Impare in Paris. He has done freelance illustration for years including clients such as Nike, Time Warner, Girl Skateboards, Pixar, Comcast, Giant Robot, Target, TiVo, 826 Detroit, Quaker Oats, Fox Entertainment, Gnu Skateboards, Swatch, and Nordstrom. His book Penguin Dreams was named a New York Times "Best Illustrated Book". Mr. Lunch Takes a Plane Ride won a Cuffie Award from Publisher's Weekly; Mr. Lunch won for most memorable character in a lead role. Going to the Getty won an Art Directors Club Illustration Award. Olive, the Other Reindeer was a New York Times Bestseller and the movie version was nominated for an Emmy Award.